The superstar singer has been dating the Australian business mogul since the summer (15), and the pair spent the holidays together in Aspen, Colorado before heading to Melbourne, Australia ahead of Mariah's planned New Year's Eve (31Dec15) performance in the city. Mariah was seen flashing a sparkling ring on her left hand during an appearance at Packer's Crown Casino and Entertainment Complex in Melbourne on Wednesday (30Dec15), prompting speculation the couple is planning to tie the knot. The singer documented her fun-filled Christmas in Aspen in a series of posts on Instagram, sharing snaps of herself spending time with her twins, Monroe and Moroccan, enjoying visits from Santa, and sledging. 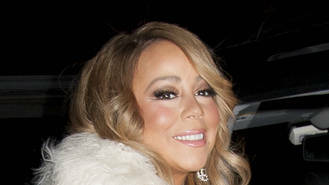 Mariah split from the twins' father, rapper/actor Nick Cannon, in 2014 after eight years of marriage, and she previously admitted her first Christmas after the break-up was tough for her and the kids. "I don't want them to see a mother saying, 'I'm going through this. I'm going through that.' They're babies - innocents. They don't have to see that yet - if ever. So I try to keep everything together because, in some instances, if you cry you're not going to stop crying..." she told Britain's Weekend magazine. "Christmas was a rough time for me personally but I got through it and you know what? It was for the kids. That was the whole thing. I have a song called Side Effects which goes, 'I kept my tears inside because I knew if I started I'd keep crying for the rest of my life with you. I finally built up the strength to walk away, don't regret it but I still live with the side effects.' That became something I sang over and over to myself because I've been through a lot over the last couple of years. I don't talk about (Nick) because it's inappropriate." Katy Perry and John Mayer have sparked rumours their romance is very much back on after leaving a Hollywood hotspot together early on Thursday morning (31Dec15). Demi Lovato is among the stars ready to ring in 2016. Jason Derulo doesn't have any New Year's resolutions. Harry Styles is writing new music with Snow Patrol's Johnny McDaid. Country music star Anderson East's stepfather has confirmed his son is dating Miranda Lambert. Singer Kylie Minogue reportedly believes she’s found ‘The One’ in boyfriend Joshua Sasse.